There are dozens and dozens of irregular words in English, which can’t be sounded out, and must simply be memorized as wholes. Correct? Firstly, it depends on your definition of irregular words. Is the word “league” an irregular word because it’s not spelt “leeg”? There’s nothing irregular about its first two spellings, and the final spelling “gue” is also found in “morgue”, “Prague”, “colleague”, “demagogue”, “dialogue”, “epilogue”, “monologue”, “synagogue”, “travelogue” and the UK spellings of “catalogue” and “analogue”. If you add “brogue”, “fugue”, “plague”, “rogue”, “vague”, “vogue”, “fatigue” and “intrigue” to this list, it starts to look like a proper spelling pattern, quite learnable and sound-out-able, and not irregular at all. Is “receipt” irregular, when its “ei” is also in “ceiling”, “conceit”, “counterfeit”, “deceit”, “perceive”, “protein”, “receive”, “seize”, “Sheila” and “Weipa”, and even its weird “pt” spelling also appears in “pterodactyl”, “Ptolemy”, “ptomaine”, “ptosis” and “ptyalin”? Though I think “receipt” is the only time it appears at the end of a word. “Asthma” and “isthmus” are the only words I can find that have “sth” for the sound usually spelt “s”, but does that make these entire words irregular? The other sounds in these words are spelt just as you’d expect, so “asthma” with four sounds is 75% regular and sound-out-able, and “isthmus” with five sounds hits 80%. The words “friend” and “straight” are usually deemed irregular words and put on "memorise holus-bolus" lists. They each have five sounds, but four or 80% are about as regularly-spelt as you can get. The only funny spellings are the “ie” and the “aigh”. The “ch” in “choir” appears in lots of other words, and even in “hors d’oeuvre”, the “d” is regular. Let’s for the sake of argument define a spelling as regular if its sound-letter(s) relationship occurs in at least a dozen common words that older kids can be expected to have heard of, and thus it can readily be taught as a pattern e.g. turned into a worksheet or used as the organizing principle for a primary school spelling list. 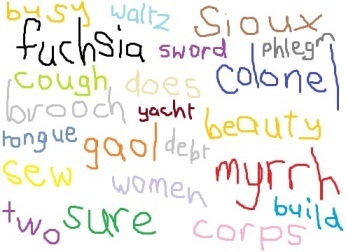 There are 315 words on the Dolch “sight words” list, perhaps the best-known of such lists, which children have been taught to swallow whole since 1948. However, about 80% of them are regularly-spelt, so why anyone is taught to memorise not decode them is a mystery. Out of the 160 sounds in these 56 words, only 59 are spelt irregularly, or 37%. The remaining 63% of the sounds are spelt just as they are in “regularly-spelt” words. This to me says we should be zooming in on the irregular spellings in these words, not tarring words that are mostly decodable with the entirely-irregular-word brush. As far as I can work out, the only words in English that have 100% irregular letter-sound relationships are (drum roll): a, are, awe, aye, ewe, eye, heir, oh, ooh, owe, sure, who. A tidy dozen. and apart from their final letter “e”, the words “are”, “awe”, “aye”, “ewe” and “owe” have regular spellings. Anyway my point is that the great divide between “regular” and “irregular” words is IMHO a false one, and sounding-out is a still a useful strategy to apply to written words in general, including the ones that contain funny spellings. This is especially true because you can help yourself remember funny spellings by saying funny-spelt words a funny way – who else says “fuch-see-uh” in their heads when they write “fuschia”, and “buzz-i-ness” when they write “business”? A topic for a future post. The sound "s": ss as in crass, less, miss, toss, fuss (arguably making "bus", "gas", "this", "us" and "yes" irregular). 2. But "four" and "your" are like "amour", "court", "course" "gourd", "gourmet" "mourn", "pour", "source", "tourmaline", "tournament" and "troubadour", so whether this "our" is an irregular spelling or a pattern in its own right, I'll leave you to decide. 3. Because the pattern "all" usually sounds like "ball", "call", "fall", "hall", "wall" etc, the word "shall" is here deemed irregular. 4. The word "very" would be more regular if spelt "verry" (like "berry", "cherry", "ferry", "Kerry" and "Terry"). But there is a lot of this sort of non-doubling after a checked vowel around, e.g. body (not boddy), copy (not coppy), seven (not sevven, except that we don't usually double the letter v) so whether this is even irregular is arguable. This entry was posted in consonants, hard words, sound-letter links, sounds, spellings, whole language on November 11, 2012 by alison. Yes, the closer you look the harder it is to find any spelling that’s not part of a pattern. I have word lists for both wh as in who and o as in to on this website. Ummm… the “h” in posthumous, vehement, and vehicle do not match the pronunciation of heir, rather they sound as the “h” in humor, hello, and high. Also, the “s” in asphalt, capsule, insulate, and peninsula sound as the “s” in aspire and sun. Hi Matt, maybe this is how you pronounce the words, but in the phonetic transcriptions in the Macquarie Dictionary I used when compiling these lists, there is no /h/ sound in posthumous, vehement or vehicle, and the letter s in asphalt, capsule and peninsula is pronounced as the palatal fricative /sh/. I daresay your accent is different from mine. As I say on my website, my lists reflect general Australian English.